Last April 30, the crowd at Araneta Coliseum witnessed an epic battle between longtime rivals, ADMU Lady Eagles and De La Salle Lady Spikers. For the past 5 seasons in University Athletics Association of the Philippines (UAAP) women’s volleyball, the two teams were always the protagonists during finals. Since then, it was the start of the fascination of Filipinos to volleyball who are known to be basketball fanatics. 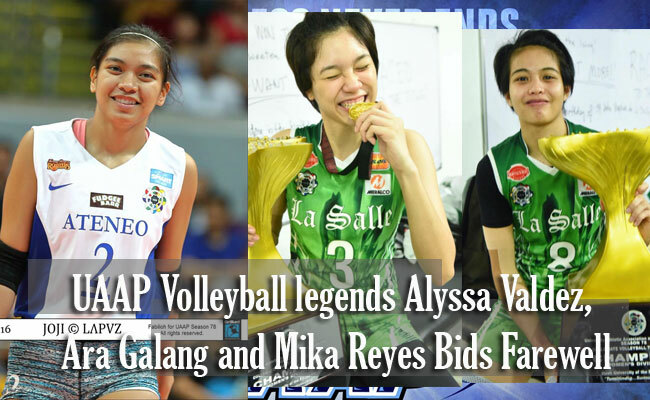 The Game 3 finals was the last time that we are going to see popular stars like Alyssa Valdez of Ateneo, Ara Galang and Mika Reyes of La Salle play in a collegiate league. At the end of the game, Galang and Reyes were celebrating their last championship for their Alma Mater while Valdez walked in the sidelines to congratulate some of the la salle players and thanked her supporters. Until now, their game is still the talk of the town and many can’t still move on but as many popular stars are graduating, some were wary if volleyball will still be popular. For Galang, she was very happy to leave la salle with a championship. Her UAAP career highlighted with 3 championships, a season MVP and a rookie award. She failed to help her team last season because of an injury and she was glad to helped them now. For Reyes, she feels good that when she was still a rookie, their seniors leave them a championship and now that she is a senior, they did the same thing for their rookies. For Valdez, who is undoubtedly the best female athlete Ateneo ever had failed to bring home a championship for the last time but she had nothing to be prove anymore cause she was a recipient of 3 straight season MVP’s and 2 championships. Aside from the 3, Cyd Demecillo and Kim Fajardo of La Salle and Jia Morado of Ateneo were also graduating but all of them are expected to play in commercial leagues.